/ The Boss of Hybrids – Toyota Prius 2016 is Here! The Boss of Hybrids – Toyota Prius 2016 is Here! think it has something to do with us being down south. We take longer to catch on to trends that have already gripped the rest of the world. Remember our love affair with Blackberry, when elsewhere people were ditching them faster than Leonardo di Caprio jumping off the Titanic? There are other examples too. One of them is our car choices. Or more specifically the type of cars we choose to drive. We love our bakkies. 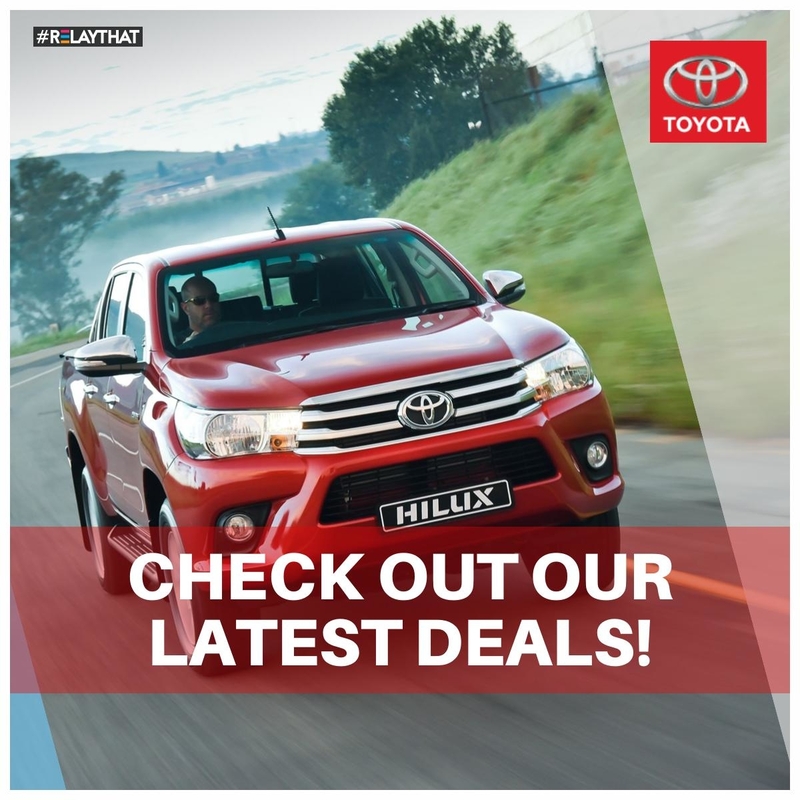 That’s evident from the sales figures with the Toyota Hilux being the top selling model. But in the rest of the developed world, there has been a huge shift towards fuel efficient cars. In Europe, where there are modern public transit systems, smaller cars have gained popularity. 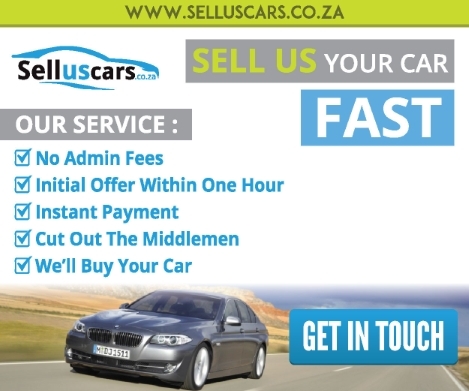 Here in SA, we’ll choose a small car only out of necessity, but deep down we’re always after that double cab or SUV! One type of car which we don’t see enough of on our roads, is hybrids. Toyota of course pioneered the hybrid market way back in 1997, with the first ever Prius. Since then it has sold over 9 million hybrid vehicles worldwide, 2 million in the US alone. A vehicle is a hybrid if it utilizes more than one form of on-board energy to achieve propulsion. In practice, that means a hybrid will have a traditional internal-combustion engine and a fuel tank, as well as one or more electric motors and a battery pack. Hybrids reuse the energy that normally goes to waste in a conventional motor car. Every time you brake, there is an enormous amount of heat energy that goes to waste. Similar case with the engine heat. Toyota’s engineers had the foresight almost 20 years ago to “always find a better way” and this led to the development of the first ever Prius, that harnesses the excess energy, converts to electricity and stores it in a battery pack for powering the electric motor. OK, sounds cool, but why should I care? Here’s a short video I came across, that will give you an idea of the satisfaction the Prius will give you. In Europe & America, the Prius frequently tops the charts for customer satisfaction. If that’s not enough, at 3.7 ℓ per 100 km’s you’re going to save about 40% off your current fuel bill. That on average could translate to an extra R1,000 in your pocket at month end! Then if all of us drove hybrids, can you imagine the quality of air we’d have to breathe? So are you sold yet? Check the short video below, on how Toyota Norway capitalised on happy Prius owners, by using them in a marketing campaign. The new Prius is the first model to use a chassis based on Toyota New Global Architecture (TNGA). It will also underpin other future models and will be joined by further platforms suitable for different vehicle applications, from compact sports cars to SUVs. The TNGA platform plays a defining role in the Prius’s essential fun-to-drive quality, giving the car a lower centre of gravity compared to the current model, and securing a more engaging driving position and more precise and responsive handling, with less body roll. This means better handling can be achieved directly from the quality of the chassis and body without having to use firmer suspension settings, or compromising ride and comfort. It makes a big contribution to the improved driving dynamics – beyond what might be expected of an eco-car. This quality is further supported by a body that is 60% more rigid than before thanks to extensive use of high-strength steels and additional reinforcement to the centre pillars’ lower structure and the panel connection. The result is superior, direct and responsive handling. These superb driving qualities are also enhanced by Prius’s new double wishbone rear suspension, which produces one-third the level of shock when driving on uneven roads compared to the outgoing model. To achieve better handling with more direct response, the front MacPherson strut suspension has been revised with an increase in the incline angle of the shock absorbers and the use of slant bearings. The chassis is fully able to harness the more responsive character of the new full hybrid system. As a result greater stability is maintained, body roll is much reduced in high-speed lane changes and performance is smoother on rough surfaces. On winding roads, the new Prius holds easily to the driver’s intended line – like a train on tracks – and there is outstanding straight-line stability when driving at speed. Sharp & Athletic. The New Prius is ready to pounce! The new Prius is not simply “another green car,” its design and high quality throughout give it greater emotional appeal and a powerful, desirable presence, underpinned by the fundamental strengths of the new TNGA platform. As Toyota’s most advanced hybrid, it is appropriate that it is an image leader and the intention has been to produce a design that makes an immediate impact. The car’s new, low-slung stance – made possible by the TNGA platform – suggests an excellent driving performance, supported by a distinctive new body silhouette that is both athletic and aerodynamically efficient. The result is a “human-tech” design with strong emotional quality, fully exploiting the opportunity presented by the car’s lower centre of gravity. Prius Chief Designer Shunsaku Kodama, who at 43 was Toyota’s youngest chief designer when appointed in 2011, led a team whose youthfulness generated a natural enthusiasm to challenge the status quo, even for a vehicle as revered as Prius. He says their focus was to “inject ego” into the car by crafting a more powerful, engaging and sporty image that would increase pride of ownership beyond Prius’s traditional ethical profile. The design theme for the new Prius is captured in the contrast created between the rich curves and hard surfaces of the bodywork. The result is a new form that stands out with its smooth yet sharp use of lines. 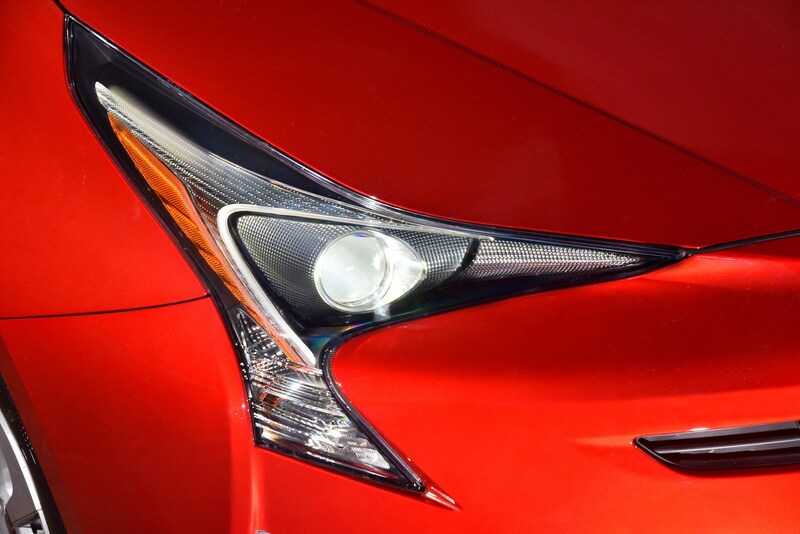 The frontal design is true to Prius’s heritage in making the Toyota emblem a strong focal point, but it also makes an impactful visual statement about its more advanced design and performance with a much lower bonnet height. Notably the front emblem sits at the same height above the road as it does on the Toyota 86 coupe. New headlights have permitted slimmer, more striking headlamp units to be designed and these combine with an intricate but unfussy treatment of the fog lights and air intakes to give the car a distinctive and intelligent appearance. The lower part of the front bumper and the shape of the lower grille and wheel arches have been designed to direct airflow around and under the vehicle. An electric shutter behind the large lower grille forms a novel feature in the car’s airflow management. Derived from motor sport technology, it opens and closes in line with the airflow cooling requirements of the engine; by remaining shut during cold starts, it helps save fuel by helping the engine reach its operating temperature more quickly. In profile, Prius displays a silhouette that is lower and more athletic. The TNGA platform has allowed for significant reduction in height in key areas to create a lower, more dynamic appearance. The overall height has been reduced by 15mm compared to the current Prius, to 1,490mm. The peak of the roof has been moved forward by 170mm, and the belt line has been dropped and angled forward and lower, emphasising the car’s stronger dynamic qualities. The rocker panel displays a light-catching surface that starts from the lowest part of the front bumper, runs beneath the front door, then races upwards, accentuating the car’s low-slung stance. 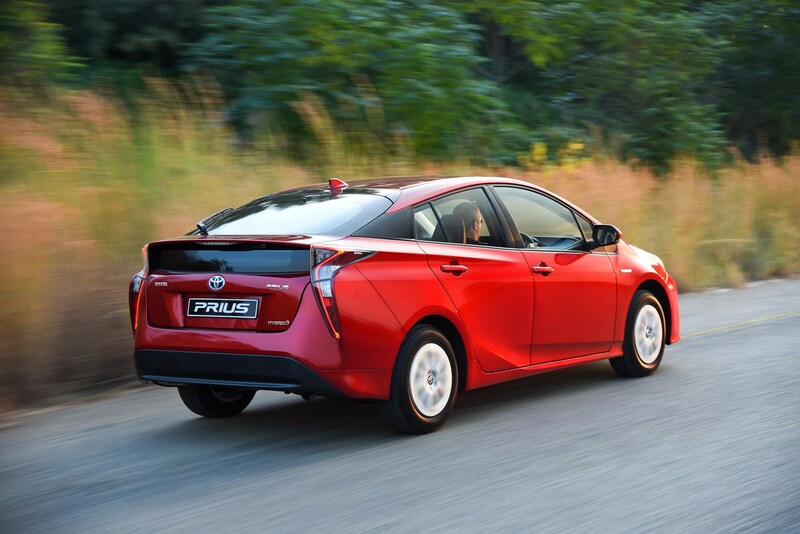 The new model retains the 2, 700mm wheelbase of the current Prius, but is 60mm longer overall at 4,540mm. It is also 15mm wider at 1,760mm. The new Prius has a unique aerodynamic treatment to the rear section of the roof, which supports the clean flow of air over and away from the vehicle. The length and angle of the rear spoiler have been precisely calculated and the bodywork tapers towards the rear corners, helping smooth airflow and reduce drag. The low roof and rear pillars are distinctively integrated using blacked-out panels that are shaped to draw air around the side windows to the rear of the car. Other aerodynamic aids include graduated vertical channels each side of the windscreen that direct airflow and rain water up and over the roof without generating wind noise. Aero stabilising fins are featured on the front quarter light trim and rear combination lamp housings, which control air turbulence along the side of the car. The new TNGA platform is also designed for the smoothest possible airflow beneath the car. The rear end design flows strongly from the rear spoiler down through the bumper, with the wheel placement further emphasising the car’s firmly planted stance. The slim, striking combination lamps have been moved to the outer edge of the car, following a sharp angle that is accentuated by the distinctive, unbroken line of the red LED tail lights. Toyota has produced a vibrant colour palette for the new Prius with seven exterior finishes available – including Passion Red, Attitude Black, Glacier White, Pearl White Metallic, Graphite Grey Metallic, Satin Silver Metallic and Dark Blue Metallic. As in the current model, Prius’s hybrid system features a 1.8-litre VVT-i Atkinson cycle petrol engine. However, the unit has been completely re-engineered to deliver significantly better fuel economy. The gas flow, combustion, cooling and knock control have all been improved and much more effective use is made of exhaust gas recirculation. 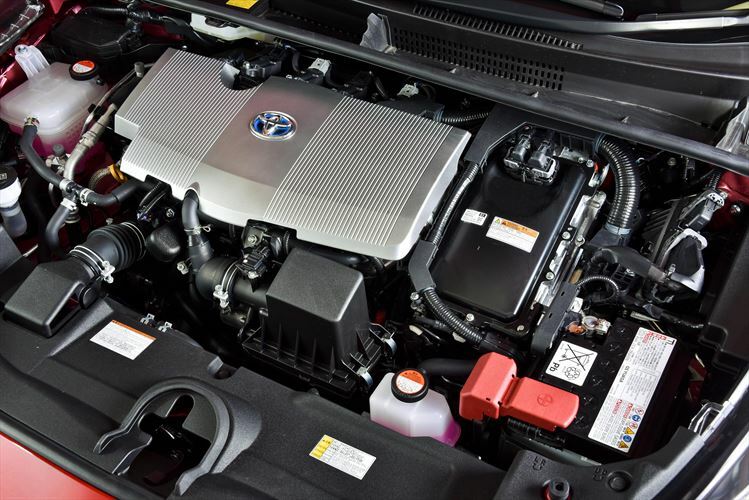 Toyota has developed a heat recovery system that uses spent exhaust gas to speed up the warming of engine coolant. This means fuel can be saved because the hybrid system is able to stop the engine earlier and more often when it isn’t needed to power the vehicle. The engine is also helped to reach its optimum operating temperature more quickly thanks to a new dual-passage cooling system that can reduce the volume of coolant flowing into the engine, when required. This helps improve efficiency during cold weather. Further work has been done to reduce energy losses, particularly those caused by friction. Measures include the use of thin-section, resin-coated connecting rod bearings and a low-friction camshaft chain. Friction created by the piston skirts, rotating parts and oil pump has been reduced and a new electric water pump has also helped cut the level of losses. Conical “beehive”-type springs have been adopted to reduce the valvetrain load. And, to ensure comprehensive improvement, the entire engine underwent computer-aided engineering analysis to achieve the best rigidity and to reduce noise and vibration. Engine cooling has been improved with a new cooling module structure and attachment, and a redesign that accommodates a lower bonnet line and helps reduce the car’s centre of gravity. There is a new grille shutter behind the radiator which automatically closes when full airflow isn’t required, improving aerodynamic performance and saving fuel. The engine’s maximum output of 72kW is delivered at 5,200rpm, with peak torque of 142Nm at 3,600rpm. Updates to the hybrid system software allow the new Prius to draw more on its electric drivetrain, allowing it to accelerate in a low engine rev range. It has also permitted the speed range of the electric motor (the range in which the electric motor can be used exclusively) to be increased by 60%, compared to the current model. This means there is less dependency on the petrol engine at higher speeds, improving fuel economy. The two motor-generators are all-new and are smaller and lighter than before to suit the new multi-shaft transaxle design, with no negative effect on fuel economy. The power control unit (PCU) has been totally redesigned, resulting in a 33% reduction in size, a six per cent weight saving and a 20 per cent reduction in electrical losses. In place of a belt-driven alternator, the new Prius uses a DC/DC converter to recharge the 12-volt battery, using energy from the HV battery. The nickel-metal hydride (NiMH) battery is more compact, so can be located entirely beneath the rear seats, avoiding any intrusion in the load space. Its cooling is more efficient and it has a greater energy regeneration range. The new cooling system features an air filter in the intake bezel, which is located in the trim beneath the right rear seat. The fuel economy achieved by the new Prius marks the largest improvement between generations of the hybrid model, achieved thanks to improvements in the hybrid system and efficiency improvements throughout the car. This accomplishment reflects Toyota’s philosophy of refining existing technology – the concept of having something good, then making it better. Every aspect of the hybrid system has been made more efficient and these improvements deliver about half the gain that’s been realised in fuel efficiency. The petrol engine uses less fuel; the electric motor-generators are smaller, lighter and more efficient; mechanical losses in the transaxle have been cut by 20%; the power control unit is more efficient; and the nickel-metal hydride HV battery is lighter and more efficient. Further gains have been made by reducing the energy load of the air conditioning system, improving the rolling resistance performance of the tyres and creating a more aerodynamically efficient vehicle design. The new Prius’s lower centre of gravity and increased body rigidity help deliver a safe and secure drive. Passengers enjoy a smooth, comfortable ride, with minimal roll. The TNGA concept has produced an increase of more than 60% in body rigidity, compared to the previous model, by using a ring-shaped, cyclical frame, laser screw welding (with a greater number of weld points) and structural adhesives. Together these contribute to achieving a more stable ride. New Prius also uses a higher proportion of high-tensile strength steel in its construction, making good use of high-strength, lightweight hot-stamp materials to achieve improved rigidity. The content of this quality of steel in the vehicle has increased from three to 19%. 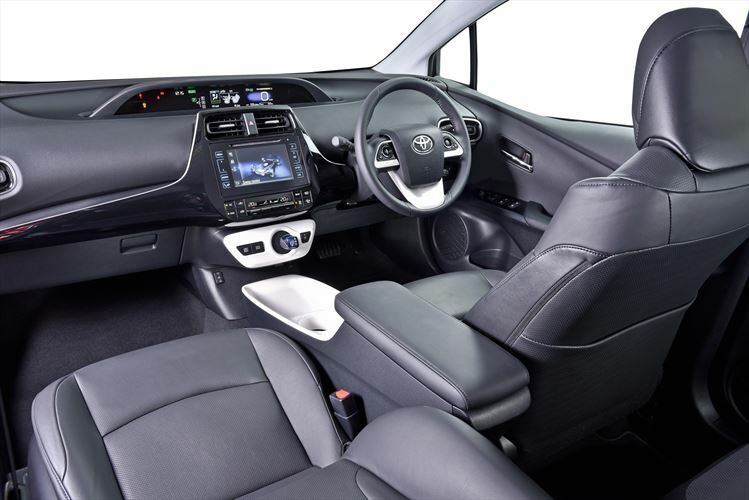 Furthermore, Toyota’s advanced Global Outstanding Assessment (GOA) methodology for designing safer cars brings the benefits of light weight, stability and excellent collision safety performance. The driving experience has been improved with better acceleration feel, achieved through an upgrade of the hybrid system control unit. Optimal use of the battery and electric motor have minimised the “rubber band” feeling when accelerating – the sense of a delay in acceleration when you press the throttle. The new Prius accelerates from 0-100km/h in 10.6 seconds. Highway overtaking acceleration from 80 to 120km/h can be accomplished in just 8.3 seconds and the top speed is 180km/h. The new hybrid system’s output – petrol engine and electric motor combined – is 90kW, and the drivetrain now delivers its power in a more user-friendly manner. The new Hybrid System allows the system to draw more on its electric power, which means that acceleration feels more natural with the engine revs building up gradually as the car picks up speed. 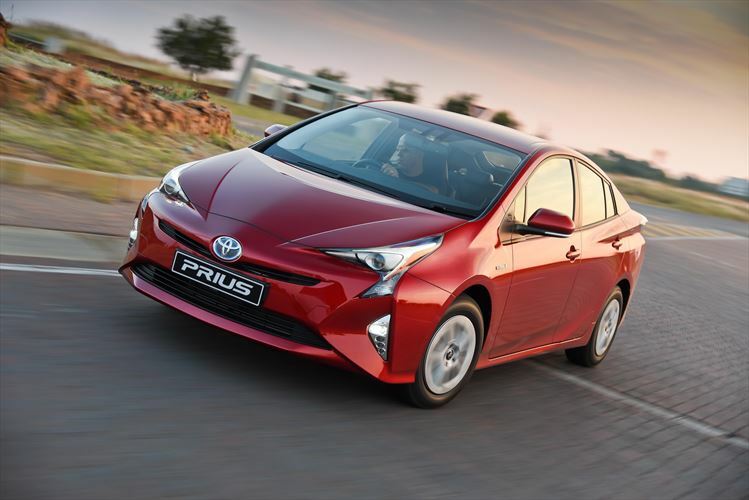 Pricing of the new Toyota Prius remains very competitive at R427 200.